A dense, enthralling and terrifying novel that describes man’s inhumanity to man in the first few decades of the 20th century in Turkey, Greece and the Balkans. It is a sprawling saga with its genesis in the peaceful village of Eskibahce in the south west of Turkey. Here Turkish Muslims and Greek Christians have lived for centuries side by side, bemused by each other’s idosyncracies but basically tolerant of each other. I was introduced to a plethora of characters whose foibles were gently exposed and whose failings were never as great as the politicians who controlled their lives from distant Istanbul and Ankara. The microcosm of this village reflects the tribulations that face all those living in the Ottoman state. I followed the journey of two friends – one a Greek Christian, the other a Turkish Muslim who are separated by war and endure different horrors as one fights the Gallipoli campaign and the other is forced to act as a slave worker. The Gallipoli campaign of First World War holds particular resonance for Australians. The date of the landing is marked by us as an anniversary to remember our fallen war dead. It was a bloody, futile disaster where too many young men were sacrificed on both Allied and Turkish sides. I had only heard the history of the invaders rather than the invaded. De Bernieres takes the reader into the trenches, to the stink and cold and heat and ordure as well as the pointlessness and brutality. Having survived the Great War, the Greeks and Turks then embarked on the War of Independence which marked the demise of the Ottoman Empire and the birth of modern Turkey. Millions were killed in a cruel conflict which only fuelled continuing enmity – the never-ending need to avenge and gain retribution for depravities and slaughters that both sides perpetrated. The solution to determine ‘peace’ was a partition: Greek Christians (who had been born and bred in Turkey) were uprooted and sent to Greece while the Turkish Muslims living in Greece were sent to Turkey. 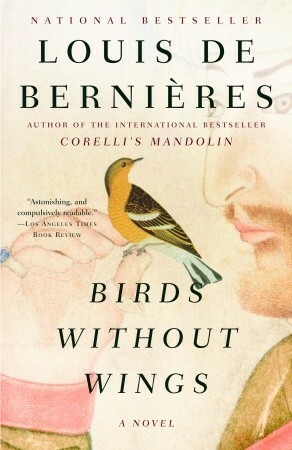 The sorrow and bewilderment of these displaced persons is once again portrayed by De Bernieres in the depiction of the townsfolk who become the pawns of these two warring countries. I recently visited Turkey where I visited one of the ‘ghost towns’ where Greek Christians were removed. It was a poignant experience as I wandered through the ruins where weeds flourished and goats grazed, and an owl had made its nest in the rafters of the empty Coptic church. Birds Without Wings was often hard going due to the density of the writing and the sheer scale of the history it described but the language is beautiful and the journey worth it due to the sympathy I felt for the wonderful cast of characters in the little town of Eskibahce.